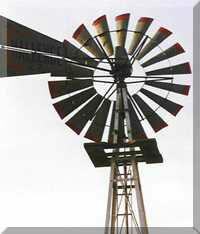 Several original Batavia manufactured windmills have been located, purchased, renovated, and erected along the Batavia Riverwalk. 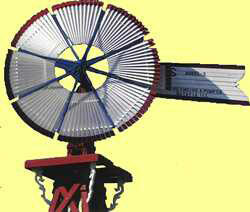 The Model E windmill displayed on the Riverwalk, is patriotically depicted in red, white, and blue colors so often favored by the U.S. Wind Engine & Pump Company. The wood that forms the red tower-within-a-tower was cut from telephone poles in order to support the massive fourteen-foot diameter solid-wheel design wooden wheel. 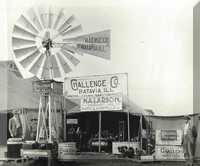 The Riverwalk exhibit currently has seven examples of Batavia manufactured windmills. 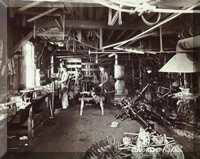 Most manufacturers are represented with a selection of Models and dates of production. All of the windmills are accompanied by a plaque with the history of the manufacturer and the particular model represented. Come take a walk on the Batavia Riverwalk to see these beauties operating as the day they were first erected.